UPDATED TIMES: Santa has provided his arrival schedule to Galloway Township News. Prepare the kids to see Santa arrive on Galloway's own Department Fire Trucks. Absecon Highlands, The Clubs and South Route 9 section, Santa arrives with the Bayview Fire Company on Saturday, December 21, 2013. Santa will hit the road at 9:30 a.m. sharp! **UPDATED Smithville section, Santa arrives with the Oceanville Fire Company on Saturday, December 14, 2013. Pomona section, Santa arrives with the Pomona Fire Company on Saturday, December 14, 2013 and on Sunday, December 15, 2013. South Egg Harbor section: To Be Determined. Just to let you know, Santa, there are little children in the forgotten part of Galloway Township. That would be SOUTH EGG HARBOR. 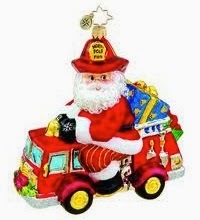 To Mayor Don Purdy, Can you borrow the fire truck from Ducktown Tavern and get Santa to go around South Egg Harbor? I know the kids would like it. Thank you, South Egg Harbor Resident. I thought he was coming East of rt 9 today (Sunday)?